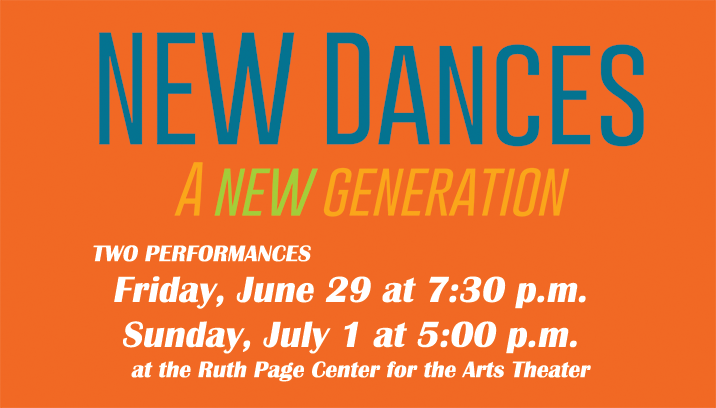 Join us for the opening night of NEW Dances 2018, a partnership between Thodos Dance Chicago and DanceWorks Chicago, returning to its original home in the Ruth Page Center for the Arts! Friday, June 29 at 7:30 p.m.
Sunday, July 1 at 5:00 p.m.
– Each performance will include a 15-minute intermission with a post-performance discussion with the choreographers. – Please note that seats are not assigned. – Those late to the performance will be seated inbetween pieces with usher assistance. Please join us for a special Cocktail Reception on site on OPENING NIGHT only! Tickets for the Cocktail Reception are $100 each and include pre-performance hors d’oeuvres provided by Leña Brava, libations, VIP seating for the Friday night performance, and a drink refresh at intermission. Artists are eligible to receive a discounted price of $50 for a reception ticket that includes access to the Cocktail Reception and one standard admission seat for the show. -Cocktail Reception starting at 6:00 p.m.
-Performance starting at 7:30 p.m.
VIP Seating: $40 SOLD OUT for Friday 6/29 Performance — but VIP Seating is still available as are Sunday VIP Seats! *Please note that the cocktail reception package includes admission to the 6:00 p.m. reception and a VIP Seating performance ticket for the Friday, June 29th performance at 7:30 p.m.
UPDATE (6/29/2018): Online ticket sales for the Friday performance are now closed; however, Sunday tickets are still available to purchase online until Saturday, June 30 at 11:59 p.m.